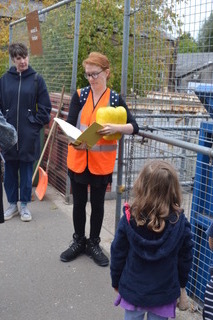 I did my guided tour / performance-lecture yesterday afternoon to a crowd of people who had booked on via the Brighouse Arts Festival website, free. There was a nice mix of familiar art scene faces and new people as well – including one person I recognised from Rubbish Conversations at the centre previously. She seemed a bit embarrassed that I recognised her from the recycling centre “like I’m a regular there!” she joked. I may be shockingly bad at remembering names and how old I am but I can remember faces. The Q&A at the end was really good and I got a lot from that. Rubbish Conversations at their best! 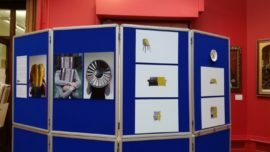 My exhibition is up at Smith Art Gallery and Brighouse Library until the end of the month but I have A LOT of information and material to mentally process now. It’s been really intense but I’ve loved every minute of it. I also hope the Suez site and area manager were serious when they were saying that I could come on site visits with them to some of the processing centres. 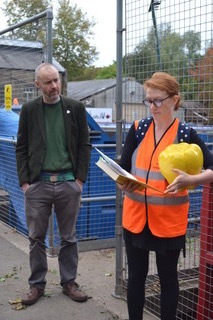 I introduced the tour talking about my residency process focussing on object histories, talking rubbish as practice and the value of rubbish in art practice, and the resultant exhibition at Smith Art Gallery and Brighouse Library. 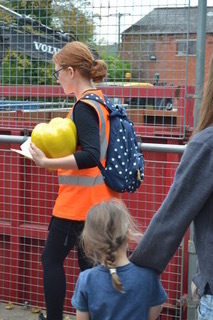 My guided tour took us around the recycling centre briefly discussing each recyclable material and recycling process. 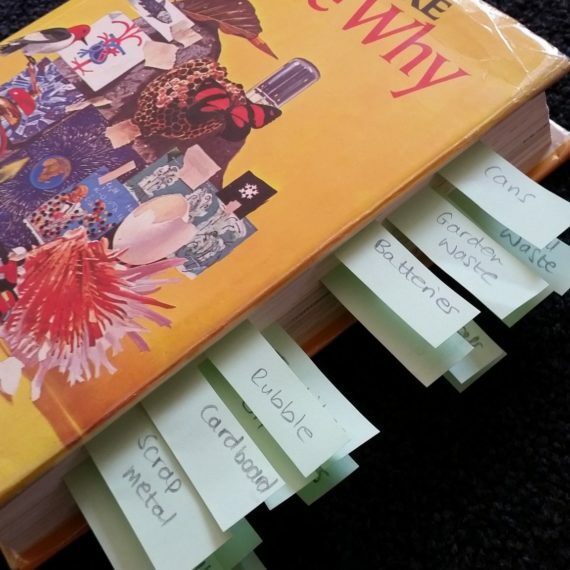 I read a short except selected from Lots More Tell Me Why “Hundreds of Answers to Questions Children Ask” (1974) select for for each recyclable material. We ended at the charity shop with a mini quiz and Q&A. Each household is allowed a maximum of 6 rubble sacks (of 20kg maximum capacity) per year. Most of this rubble is crushed and used as road base material. Aluminium and steel cans are separated by a huge magnet and the aluminium cans crushed into bales. They are then shredded and smelted and then made into rectangular shaped ingots ready to be rolled back into sheets of aluminium. p.50 What doesn’t all coffee taste alike? Gas bottles are sorted and sent to suppliers to be refilled. p.346 What makes a balloon rise? This paint goes to New Reach in Bury which sells about 37,000 litres a year, using 5 or 6 base colours, which are then resold to companies like Dulux. Gloss paint is classified as hazardous but emulsion is not. Fence paint, such as creosote, is not taken here. Fridges and freezers are taken to specialist recycling centre in Telford where they are deconstructed within a sealed environment so that any Ozone Depleting Substances can be safely removed. The remaining materials are separated mechanically into individual product streams including plastics, ferrous and non-ferrous metals and foam to be recycled or reused. TVs and monitors, known as e-waste, and are sent to specialist processing centre in Huddersfield to be broken down and precious metals recovered to be recycled. The recycling charity Waste & Resources Action Programme (WRAP) estimate £140 million worth of clothing goes into landfill each year. These textiles are shipped out to be recycled in other countries. p.183 How old is weaving? Batteries contain a variety of toxic heavy metals that are energy intensive to recycle. Some types of battery are less toxic and easier to recycle. The plastic is burned away at high temperatures and the metals smelted down to be made into new materials. p.21 What is the corona of the sun? This used to be the recycling centre when the land behind was the former tip. The roof has gone and it’s considered semi-derelict. Glass is taken to Glass UK in Barnsley where it is crushed, decontaminated and then melted at 1500°C to make new glass. When there is an excess in glass needed for production, it is used in tarmac. p.156 When were spectacles invented? Lightbulbs are processed and broken down into their constituent parts of: mercury, phosphor powder, glass, metals, cardboard and plastics, which are then recycled. p.328 What does AM PM mean? Although it gets dirty, used oil can still be cleaned and re-used as an industrial burner fuel, hydraulic oil, incorporated into other products or re-refined back into new lubricating oil. p.123 Where were the first fossils found? Plasterboard contains gypsum, which is a sulphate, but classified as non-hazardous, however if sent to landfill it must be buried separately to biodegradable waste. It can also be recycled back into plasterboard. p.372 How many kinds of nails are there? Scrap metal goes to the processing facility to be screened, decontaminated, sorted and baled ready to be smelted and made into sheet material. p.72 How is aluminium foil made? Electrical items are broken down into fragments and sorted with vacuums and magnets into: Ferrous and non-ferrous metals, circuit boards, cables, batteries, cardboard and motors, which are then sent to be processed to reclaim and recycle the materials. p.206 How does the brain store information? Garden waste is mainly turned into compost. p.91 Why is the four-leaf clover lucky? When general waste is taken to be processed, a robotic machine sorts and picks out materials including glass, metal and cardboard to be recycled. The rest is separated into waste suitable to be burned for fuel and the rest for landfill. p.225 How many odours can we smell? Cardboard is shredded, pulped and filtered to remove decontaminates. 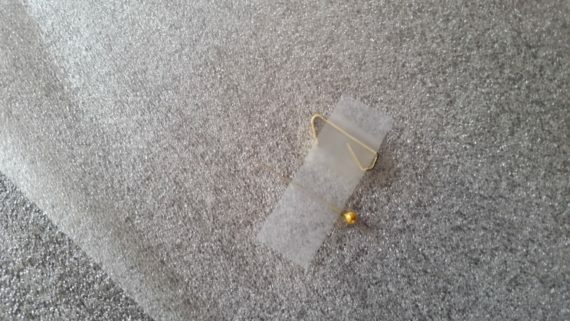 It is then mixed with new material, dried and pressed into thin linerboard. These linerboards are then glued together to make new cardboard. p.58 What is the tallest tree? Wood is shredded, then compressed and glued into chipboard. p.151 Who made the first table? 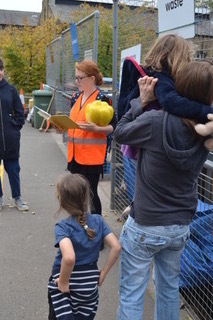 Items considered resellable are intercepted at the skips by the staff or taken directly to the recycling centre by customers where the staff assess it’s potential resale value. Everything is weighed to contribute towards the total percentage recycling statistics this site is required to produce. Q1: Which skip do trees go in? A: Garden waste. Although it’s wood, it does not go into wood recycling. Q2: Which skip do old filament bulbs go in? A: General waste. Only new style bulbs can be recycled. Q3: Which glass bin does blue glass go in? Q4: Which skip does empty paint go in? Q5: Which recyclable material is the most valuable? A: Cardboard or textiles depending on the recyclable materials stock market! Q6: What material in light bulbs makes them classified as hazardous waste? Q7: What is the biggest hazard on site? Q8: Which skip would a metal and electrical object go in? A: Electrical – prioritised for the electrical component value. Processing strips the object down and sends metal to be recycled, whereas scrap metal processing cannot do this. Yesterday was installation day. The blue baize boards had arrived and been put into position. I put the velcro on the back of my prints and decided which order they should go in, to the soundtrack of the piano being tuned ready for the festival launch. I didn’t have the right nail or pin to hang the plate so said I’d pop in today to hang that. We checked the video worked and I handed over my booklets and postcards. Job (almost) done! I went back today with a gold coloured dressmakers pin which was in the sewing box I inherited after my mother died. She would’ve loved that it’d had this new use. DHL messaged to say my postcards were arriving today and Marc the Printers emailed to tell me my booklets would be ready for collection at 10am today. I updated my DHL information saying they could leave the package in the recycling boxes if I wasn’t in as it’s not bin day and set off to Salford. 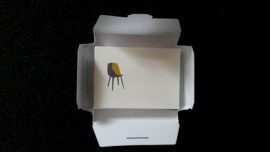 The booklets are great even if I say so myself! I’m already preparing one for a zine library. I got home and was having lunch and DHL arrived with my postcards. No recycling box repository today. Also happy with them! 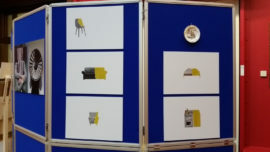 I’ve put my video files on USB and just need to find a picture hook, booklet stands and print my exhibition information out and I think I’m ready to install tomorrow morning. 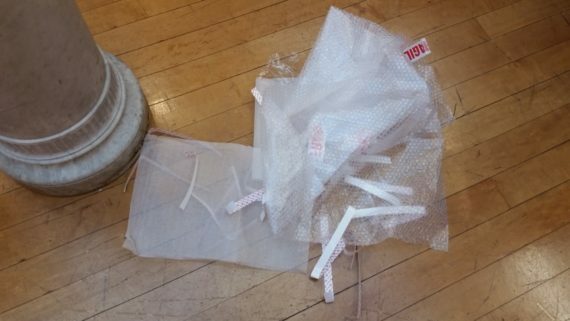 My display boards are arriving at the gallery and library today apparently. Busy day tomorrow! 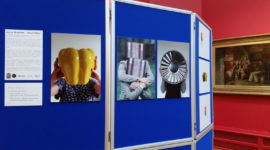 It’s my exhibition opening at Brighouse Library on Saturday! I’ve been working flat out all weekend and juggling exhibition prep with prep for another event I’m doing on Thursday: Interchange. I got my publication off to print on Friday, postcards off to print, and am making progress on my film. The film will be entitled Recyclables and is a collection of photographs selected from the hundreds I took of the objects I discovered at the Recycling Centre. I’ve annotated these objects with their stories. So far I’m halfway through editing the images and frames although I’ve yet to decide what order they should be shown in. I’m wanting to play with associative imagery as this is something that I focussed on during my residency. Anyway, I should definitely be getting that finished instead of writing about getting that finished! 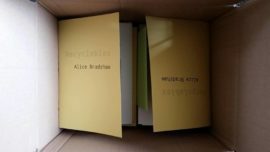 I will need to collect my publication from Salford at some point this week and my prints from the printers in Sowerby Bridge. I also need to write and print some exhibition text to go alongside my film and prints and decide how much to charge for the publications and postcards. At the moment I’m thinking £4 and £1. I’ve also just issued a press release about my upcoming show and performance (below). For some reason I nearly credited a discarded image I used as Matisse instead of Cezanne for some reason. I thought it seemed odd I’d written that. I’m glad I realised in time on a final proofread as that would’ve been a bit embarrassing! 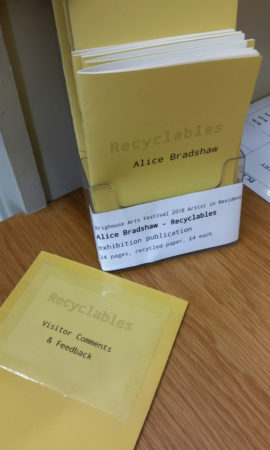 Alice Bradshaw is Brighouse Arts Festival 2018’s artist in residence based at the Brighouse Household Waste Recycling Centre. 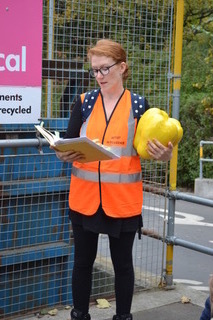 During September, Alice was based at the local recycling facility ‘talking rubbish’ with staff and members of the public. Alice has been inspired by these conversations and the objects discovered in the skips and in the on site charity shop and has made a new series of work including a new film and publication, both entitled Recyclables, and a set of prints and postcards that will be on display at Brighouse Library through October. 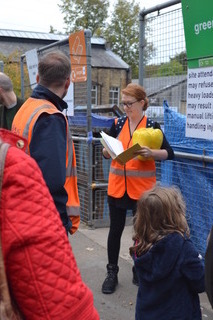 She will also be performing a guided tour of the facility on Thursday 11th October at 1pm which is free and bookable via the Brighouse Arts Festival website. 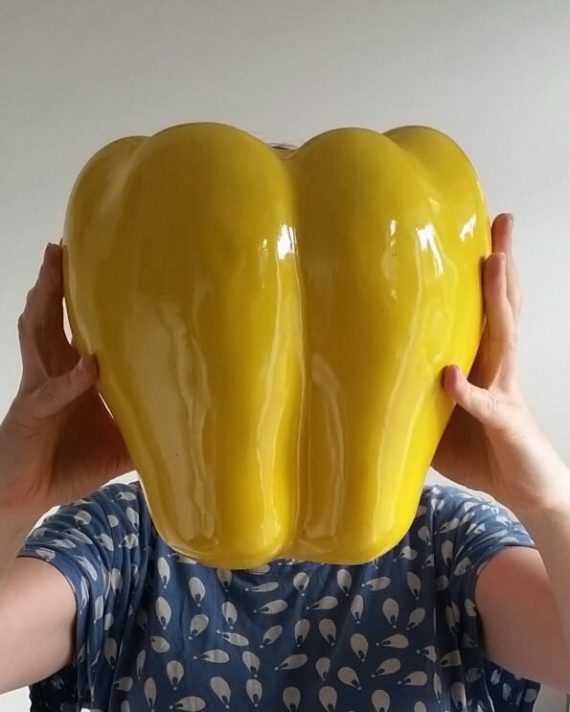 Alice is founding director of the Museum of Contemporary Rubbish and completed her Masters by Research with merit on the value of rubbish in art practice at the University of Huddersfield in 2015. Her art practice is multidisciplinary, spanning sculpture, installation, video, drawing, sound, performance, writing, publishing and curating. 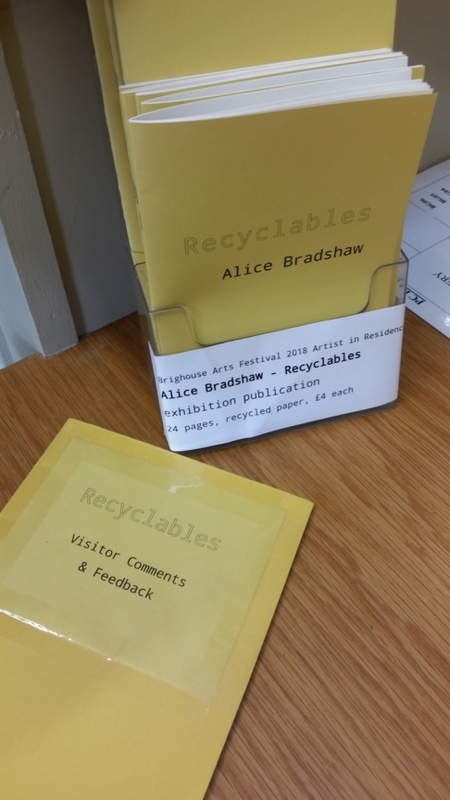 Arts for Brighouse and Suez have arranged and facilitated Alice’s residency at the Brighouse Household Waste Recycling Centre. 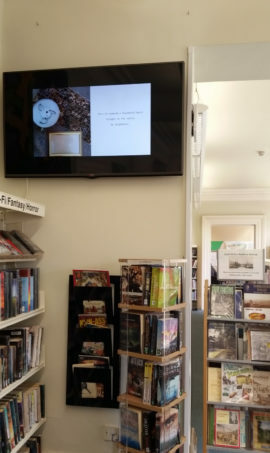 509 Arts have supported the production of Alice’s new publication and exhibition at Brighouse Library.